A former radio and television reporter and producer, Rita led a documentary television production team at the Foundation that won four Emmys, several regional Emmy nominations and one Telly award. She served on the President’s Advisory Commission on Water for the University of California, and has served on numerous boards including Water for People, an international program assisting people in developing countries to obtain safe drinking water. She has received several special and lifetime achievement awards for her work on water education, but she is proudest of being named a “Super Hero” by the California State Fair for educating Californians on water. She received a master’s degree in telecommunications from San Diego State University. To the many tributes to Kevin Starr, I add mine. So many of us, his associates and friends, want to express our thoughts on the exuberance and talent we witnessed in the larger-than-life man. Living in the semi-arid, Mediterranean climate of California, drought always lingers on the horizon. People believe they are ready to face the next dry period, then conditions arrive testing whether that is the case. There are areas in California where groundwater is pumped faster than it can be naturally replenished. This isn’t news to anyone familiar with the problem but after many years, the time may be coming when an effort is made to seriously reverse course on what many call an unsustainable practice. Lake Tahoe has a way of inspiring superlative descriptions, some of which have come from well-known people. Will New Water Delivery System End Water Wars? 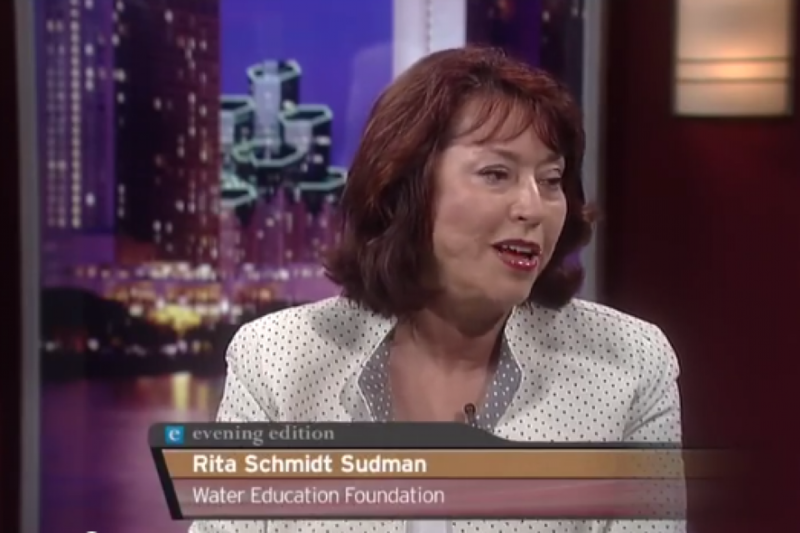 Rita Schmidt Sudman, executive director of The Water Education Foundation, and Tom Wornham, vice chairman of the San Diego County Water Authority. Balancing water supply and demand has never been a simple equation when it comes to the Colorado River. Serving as the “lifeline of the Southwest,” the river provides water to 35 million people and more than 4 million acres of farmland in a region encompassing some 246,000 square miles. Supplying water, generating hydroelectric power and protecting endangered species have all shaped development and management of the river. These issues have generated their share of conflict. But for more than a decade the river’s diverse stakeholders – the states, the federal government, Mexico, Indian tribes and environmentalists – forged new agreements and partnerships to confront the challenging issues of the future. For years, California has struggled with how to provide water to its citizens from the Sacramento-San Joaquin Delta in a way that allows for a reliable supply while attending to the needs of the environment and the Delta community. A complex, controversial and expensive process called the Bay Delta Conservation Plan (BDCP) is in the spotlight as the lead federal and state agencies move toward choosing an option that will have a lasting impact. Balancing water supply and demand has never been a simple equation when it comes to the Colorado River. Serving as the “lifeline of the Southwest,” the Colorado River provides water to 35 million people and more than 4 million acres of farmland in a region encompassing some 246,000 square miles. The 1922 Colorado River Compact that divided the water among the seven Western states was straightforward in its allocation formula, apportioning 7.5 million acre-feet to each basin. But in the 89 years since the Compact was signed, a subsequent treaty to provide water to the Republic of Mexico, Indian water rights settlements, and operational changes for the environment have all challenged notions of how much water is reliably available to “develop” for urban growth and agricultural uses. Two days before our annual Executive Briefing, I picked up my phone to hear “The White House calling… .” Vice President Al Gore had accepted the foundation’s invitation to speak at our March 13 briefing on California water issues. That was the start of a new experience for us. For in addition to conducting a briefing for about 250 people, we were now dealing with Secret Service agents, bomb sniffing dogs and government sharpshooters, speech writers, print and TV reporters, school children and public relations people.